Want some butter flavored topping on those eyeballs? 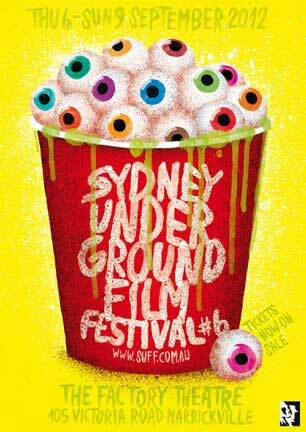 It’s the grotesque and cuddly poster for the 6th annual Sydney Underground Film Festival, which will run on Sept. 6-9 at the Factory Theatre in Marrickville. It was created by artist Stefan Fähler, who did an amazing job! You can also download a version of the poster yourself and print it out. As we’re still quite a few weeks away from the festival, there’s no lineup available yet, but the Underground Film Journal will have it up as soon as it’s ready!